I decided to get into RC aircraft with FPV (first person view) and did it the hard way by learning it all myself. This is the guide I wished I had when I had started. I was never interested in RC flying because as far as I was concerned, the plane is the one having all the fun. FPV changes that by putting a little camera on the plane and letting you fly from the plane's point of view. Now I can be the one having the fun, and so can you! I wanted to teach myself flying and FPV. Before I began, I carefully considered all the factors involved and judged whether what I was planning was reasonable and efficient, or just needlessly harder than it had to be and maybe a little reckless. I did it anyway. 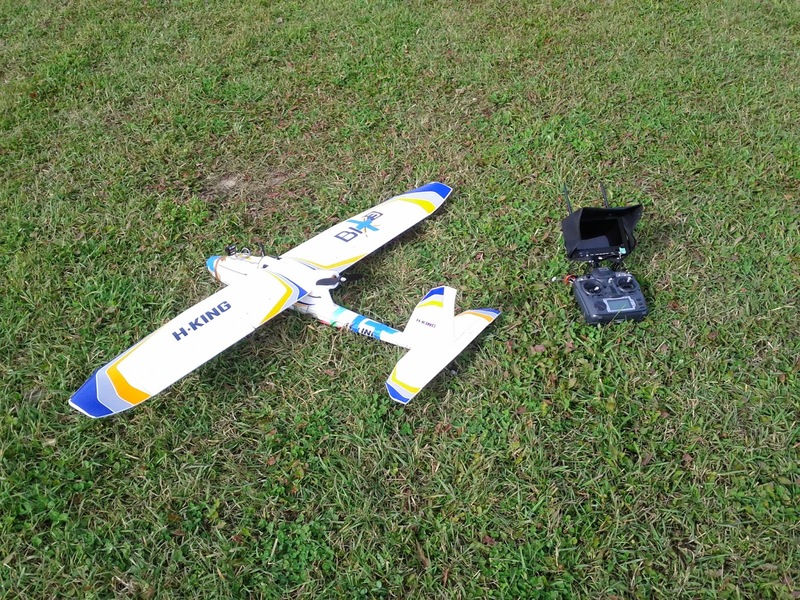 I had never flown RC aircraft before, but I have some small experience with RC cars from a long time ago. Wading into modern RC was a strange mixture of things that are either totally different now (and is common knowledge taken for granted so no one explains any of it), or things that haven't changed at all in the past 25 years, so there was a learning curve and a "purchasing curve" where I bought a few things I didn't need, and had to buy some things I didn't realize I was missing. I also went through a whole plane before actually getting past the first few stumbling steps of Learning How To Fly From Scratch. You can avoid some of this by learning from what I did. If you're at all like me, then you can benefit from the lessons I banked. Here is the guide I wished I had when I decided to dive into FPV RC flying. You should be comfortable with basic electronics and be handy with mechanical things and tools. If not, you will face challenges trying to do this stuff. There is very limited "plug and play" involved in this hobby, especially with FPV. But it can be very rewarding! I hope you find this guide useful, but if you run into something that doesn't match your expectations don't look at me, I've never done this before. I know perfectly well that if you are not going to be safe and considerate, then me telling you to be safe and considerate isn't going to make you do either. Always be in control. If you can't be sure of your ability to control your aircraft (because you're a beginner), then compensate for that with control over the environment you fly in by choosing a spot where even totally losing control of your plane only puts yourself and your own equipment at risk. Don't fly somewhere where your plane could crash into a person, someone's home, vehicles, and so forth. Losing your radio link or your video feed can easily lead to loss of control even if you're confident of your flying ability. Consider what could go wrong and plan accordingly. If you can't control a thing, control where it happens. Ideally do both. Effective planning for failure is in layers and depth. Intentions & Hopes are not plans. When things go wrong in the air, they tend to go wrong very quickly. Fun example: RC Crash Compilation on YouTube - watch how many look perfectly normal and stable before everything goes horribly wrong. Planes are quite fast, probably faster than you realize if you are brand new to this. Also they don't turn on a dime. An empty lot that looks plenty big to you is probably quite cramped for a plane. Flying a plane requires confidence and a certain amount of speed. You can't just edge it along at a slow walk to get used to things. It needs to be moving at a certain minimum speed, or it just falls. Use Gorilla Glue on foam, especially for repairs. E-6000 works on everything else. Center of Gravity (COG) is extremely important. Your plane needs to balance level (or slightly nose-heavy) at its COG which will be somewhere near-ish the middle of the wings. Slightly nose-heavy is OK. Tail-heavy is bad. You can tape metal washers or other weights to the plane's fuselage to adjust the balance as needed. When measuring COG, make sure the plane is doing a "full dress rehearsal". Put everything the plane would have on or in it including the battery and anything else onto the plane when measuring COG. Even a lightweight-seeming canopy cover makes a difference. Whenever you change something in or on the plane, re-check the COG. The ESC (electronic speed control, aka Throttle) provides power (taken from the main battery) to the radio receiver. You don't need a separate power supply for the receiver. This means the "BATT" plug on the receiver will be vacant. Programming an ESC (i.e. calibrating it) is done this way: Begin with transmitter ON and Plane OFF (battery disconnected). Push the throttle stick all the way up. Now turn on the model (plug the battery into the ESC) - it will beep at you. On the transmitter, push the throttle stick down to minimum. You should now hear the normal startup beeps from the ESC. Power the plane down (disconnect the battery). You are now good to go. You only need to do this once under normal conditions. Always power on the transmitter first, then the plane. Power off the plane first, then the transmitter. "Switch Error" on the Turnigy 9x means that one or more of the switches are not in the correct startup position. Flip all switches "up" or "back" and try again. A fully-assembled 1500mm wingspan plane has a hard time fitting in a car. The plane, including a battery. The transmitter which controls the plane by radio signals. 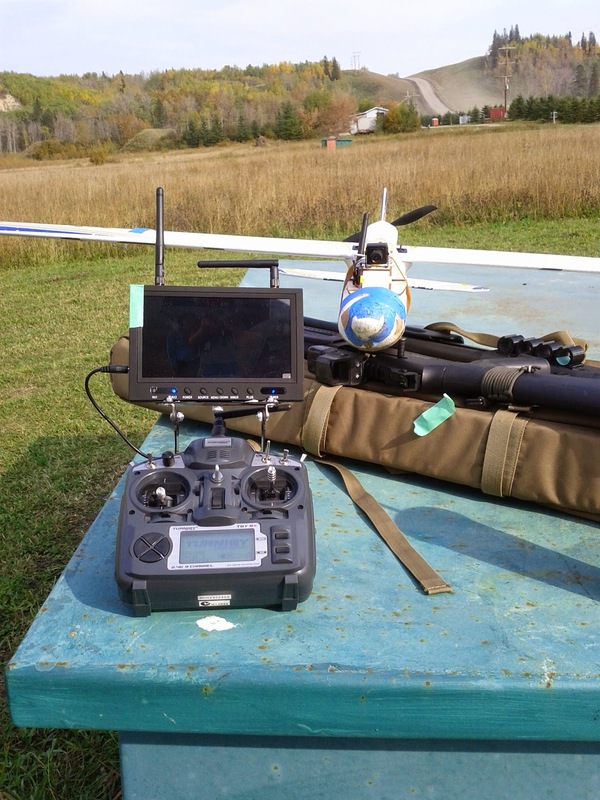 FPV equipment, which includes a camera on the plane and a video transmitter. On my plane this is self-contained in a removable platform with its own battery. 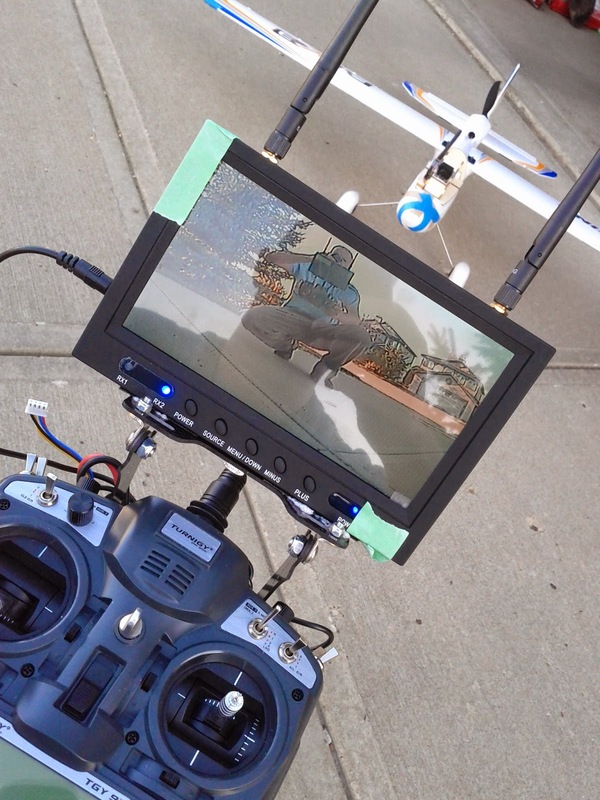 A way for the pilot on the ground to see the video from the camera. In my case, it means an LCD with built-in video receiver attached to my transmitter unit. Launch and fly the plane, watching either a timer (or a battery readout if you have added one) to make sure you land before the battery is killed. Bring the plane down and land. I find it more enjoyable to fly the plane by watching the camera feed. I find it easier to take off and land while watching the plane. Here is the actual hardware I use in flying. I bought it all from HobbyKing. There is more than one approach, but this is what worked for me. Here are links to parts, along with my comments. Bix3 PNF FPV Airplane from HobbyKing - It is PNF (plug-and-fly) which means it is mostly assembled and comes with motor and servos and ESC (electronic speed control, aka Throttle.) It just needs battery and a radio. The Bix3 has some nice features that will work well for us. It is also economical, and it flies well. Servo Extension cables - these will come in very handy during assembly. Eagletree Guardian 2D/3D Stabilizer - Very useful especially for beginners! The manual for this device can be daunting because this unit is capable of so much, but a very basic implementation will give us everything we need. 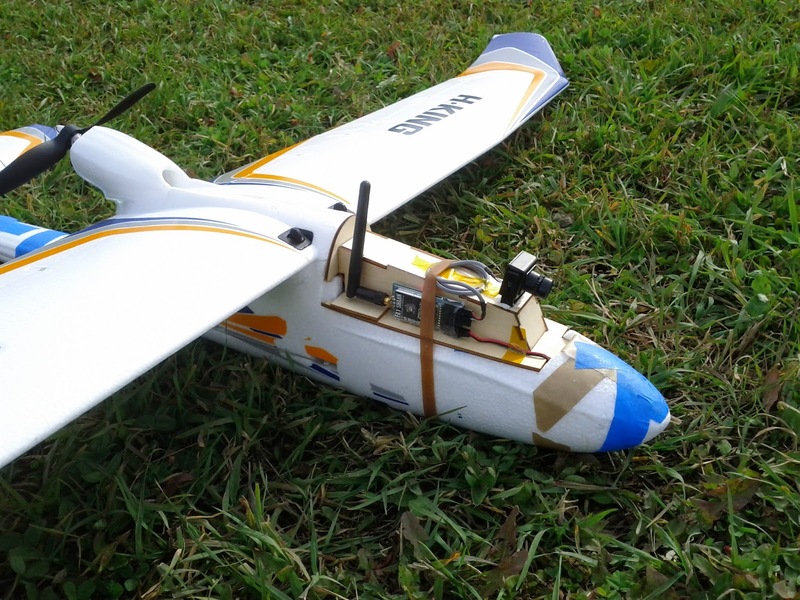 In short, it works as a man-in-the-middle and automatically moves the plane's control surfaces to keep the plane stable and level while still letting you control everything. Highly recommended, especially for novice flyers like I am. Two (or more) batteries for the plane - try to stick with one make and model of battery for the plane, so that COG won't change if you swap batteries. You'll need at least one for the plane. The other will be used to power the FPV video display. Battery charger - This unit plugs into a normal wall socket and charges either 2S (7.4v) or 3S (11.1v) batteries. You need a special charger to charge Lithium-Polymer batteries (Li-Po). 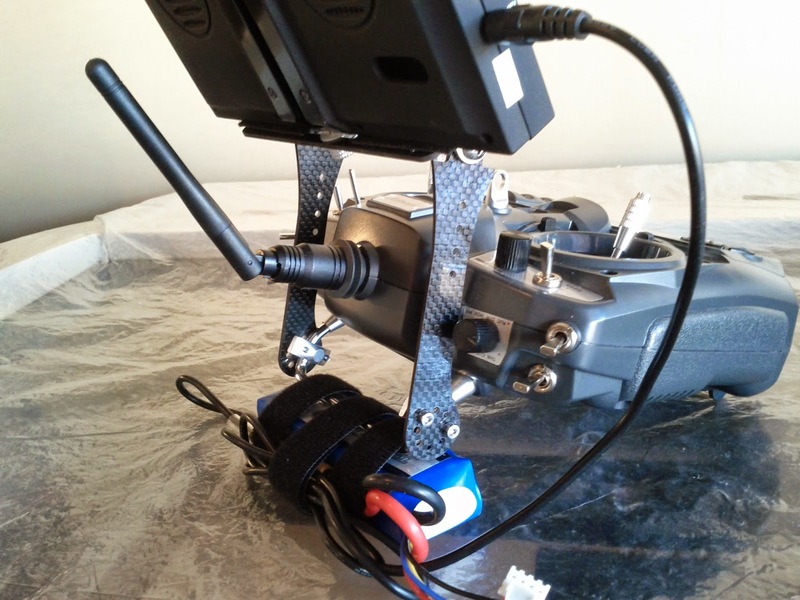 Monitor and wireless receiver for FPV - This unit has worked well for me. It is Fat Shark and ImmersionRC compatible, and also known to work with Boscam transmitters. It will also work with others as well but I know those three are good to go. This monitor is powered by an 11.1v battery, just like the plane (which is why I said to buy at least two - one for the plane and one for the monitor.) NOTE: A few days ago this unit stopped working, I don't know if I just got a lemon, or whether they are of risky quality. I opened a warranty ticket. Adapter for FPV monitor power cable (JST to XT60) - This will save you from needing to do some soldering. XT60 is the power connector on the 11.1v batteries, but the monitor's power cable doesn't come with an XT60 connector attached to it. Low voltage alarm for the FPV monitor battery - Totally optional, but it will help you recognize when the battery you are using for the receiver is too low and needs to be recharged. It is bad to discharge lithium-polymer batteries too much. 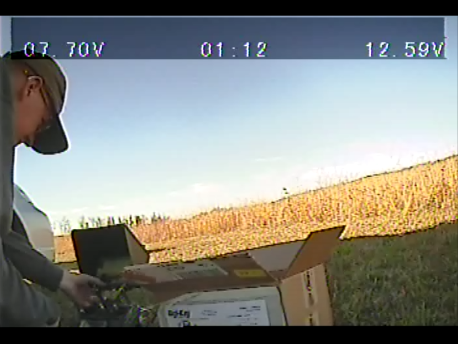 I killed one battery by accidentally overdischarging it while testing the FPV monitor. Bracket for mounting FPV monitor to the radio controller - Optional but recommended, this one works fine but is nothing special. It will fit the Turnigy 9x. If you don't use something like this, you'll need someone holding the FPV monitor for you, or prop it up somewhere (and somehow). Fat Shark power adapter - Handy in that it provides an easy way to connect battery balance plugs to feed the camera. Battery (2S 7.4v) powers the FPV transmitter and the camera. This is optional, you can power the transmitter and camera from the same battery the plane uses and it will work fine. I give it its own battery so the FPV gear can be standalone. You will need to do some minor soldering here and there to make some connections work. I write this now that the snow is down and I have had a fair bit of experience with my setup. The "rubber duck" (linear polarized) antennas that come by default on the video equipment always worked fine for me. I upgraded to Circular Polarized (CP) antennas to try them out, but found that range was not actually any better for me. I fly exclusively in wide open areas. I experienced a better signal when I was directly overhead (linear antennas would scramble a bit in this position) but no other improvement I could detect. Every product page will tell you you need the CP antennas for best range and performance, but my advice is not to sweat the antennas on the video equipment. Experiment later, sure. But the rubber duck stick antennas will be fine. The weight and size of the units I listed will fit nicely onto the Bix3's wooden FPV platform that replaces the cockpit. This, and using a separate battery for the camera and transmitter makes the FPV equipment self-contained in the platform, so in the event of a crash it will simply pop off and will not "yank" anything inside the plane along with it. There are other and cheaper FPV hardware setups available, but this is the one I used. Build the plane according to the directions included. Mark the COG (center of gravity) line under the wings so you can balance the plane before flight. The manual will tell you how to find it - it is some number of millimeters from the nose of the plane. On mine, this came out to right at the trailing edge of the support tube in the wings. Don't bother with the landing gear wheels unless you are actually going to be taking off and landing on very smooth ground or an actual road. If you are landing on grass, it is easier to just land the plane on its belly. Stabilizer attached to small wooden "shelf" right at center of gravity, which is the optimal place for it. Wire the plane up. Use servo extension cables wherever it makes sense. I put the ESC near the nose (closest to where the battery goes, in the nose), the stabilizer on the little "shelf" I made, and the radio receiver under the wings. I tried to keep the motor wires as far from the rest of the electronics as I could. The Eagletree Stabilizer will be a "main in the middle" between the radio receiver and the servos. Refer to the manual for the stabilizer for details. Turn all three of the adjustment screws on the stabilizer to maximum (all the way to the right) before installing. There are conventions regarding what gets plugged into which channel on the receiver: Ailerons to channel 1, Elevator to channel 2, Throttle to channel 3, Rudder to channel 4. 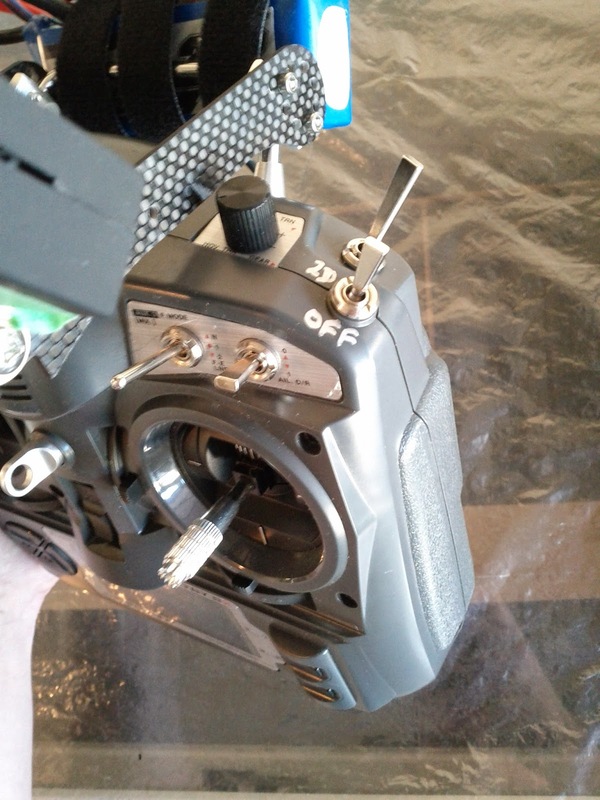 We will use Channel 5 to control turning the stabilizer on or off - it goes to the MOD input on the stabilizer unit. Channel 6, 7, and 8 will remain unused for now. 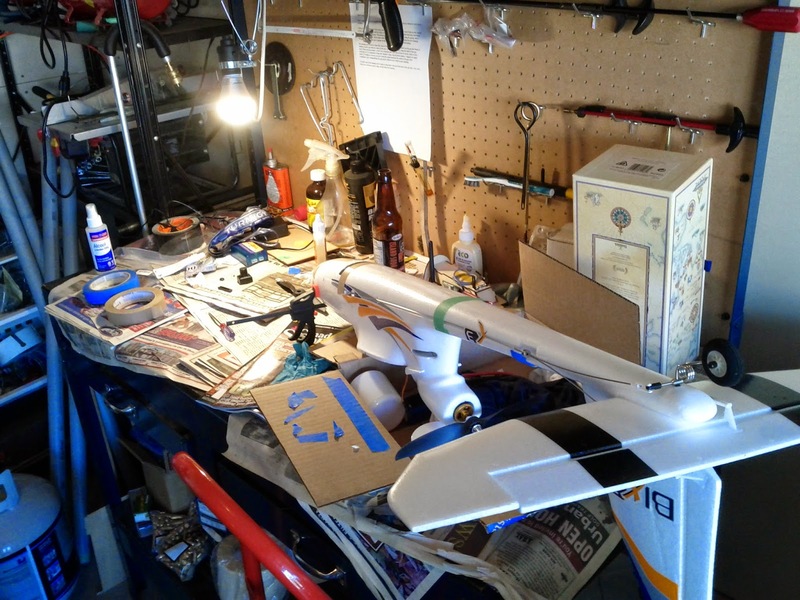 A servo cable extension to and from the Y-harness for the Ailerons will make it easier to connect and disconnect the wings if you plan of removing the wings for easier transport. A fully-assembled 1500mm wingspan plane has a hard time fitting in a car. I glued the transmitter and the camera bracket down in sensible spots, and taped the small 7.4v battery inside the wooden platform. You can omit using a separate battery and plug into the balance plug of the plane's battery instead. I prefer to have the platform be a standalone assembly that isn't actually connected to the rest of the plane. It causes less damage when it crashes that way. If you happen to be using a Boscam transmitter, channel 1 is all switches DOWN. Channel 2 is UDDU DDDD. For anything else, you're on your own. Assemble the frame for mounting the monitor onto your transmitter. The picture below is what worked best for me. The following configuration will make your model fly what I'll call "videogame style" where left is left and right is right, but down is up and up is down. The nearest top-right 2 position switch (marked GEAR) will control whether the stabilizer unit is in 2D mode (switch away from you) or OFF (switch towards you). Labeling this switch will come in handy. "Away" is Stabilizer in 2D Mode. "Towards" is Stabilizer OFF. Power on. Hold the MENU button to enter configuration. Go to SETTING, Under REVERSE, reverse AIL and RUD. Under AUX-CH, set CH5 to GEAR. Now go to DISPLAY. This will display a graph of the different channels and how they respond to how you move controls and switches. Plug the FPV equipment into the battery. Power up the FPV monitor. You should see a video feed. Ensure all switches on the transmitter are in the "Start" positions (either in the "up" position or "away" from you.) Power up your transmitter. Power up your plane. You should hear a few startup beeps from the ESC a few moments after plugging in the battery. Disable the Stabilizer by flipping the top-right 2-position switch that is nearest you to "Stabilizer Off" which is towards you. (Away from you is "Stabilizer ON in 2D Mode".) We don't want the unconfigured stabilizer to interfere right now. If you can see the stabilizer unit, the LED should be OFF as a result. Moving the throttle slightly up should start the motor. Turn it back off. Moving the left stick left and right should move the rudder. Left moves it to the left, Right on the stick moves it to the right. Moving the right stick up and down should move the elevator. Up on the stick moves the elevator down. Down on the stick moves the elevator up. Moving the right stick left and right moves the ailerons. Right on the stick moves the left side down and the right side up. Left on the stick is opposite - left side up and right side down. Before the stabilizer can be used, we need to do a configuration to tell it what "level" is. (In the manual this is referred to as "Reset Level Flight and Trims".) The transmitter needs to send a special signal to trigger this configuration, so we need to make a slight change then put things back to the way they were. Under SYSTEM, go to E.POINT and change GYR (which is channel 5 and connected to the MOD input on the stabilizer) back to 100%/100%. Arrange your plane so that it is perfectly level and straight. Now power up the model. Within 15 seconds, toggle the the top-right 2-position switch that is nearest you quickly once. In other words, it starts in the "away from you" position, so flip it towards you then immediately back away from you. 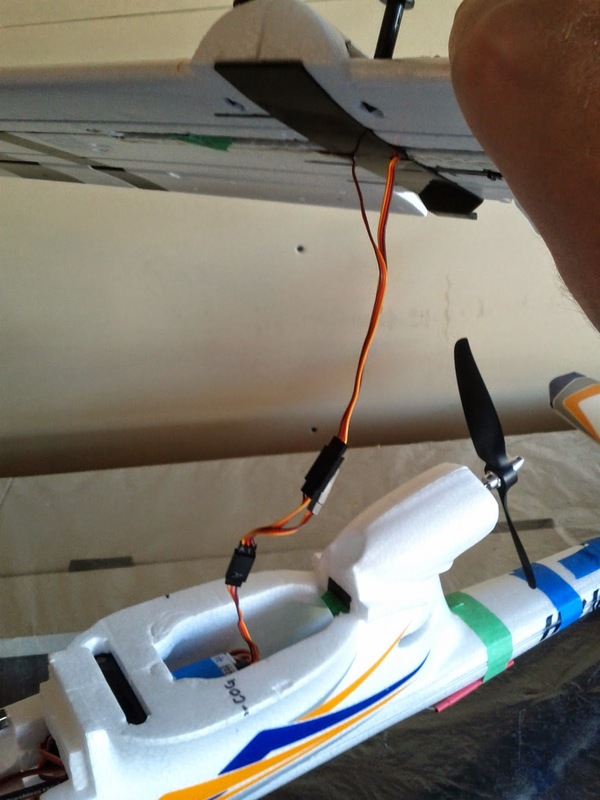 The plane's servos should "twitch" once in response if this is successful. If successful, go back to SYSTEM settings on your transmitter, under E.POINT, and change GYR back to 000% and 100%. The stabilizer is now calibrated, and the 2-position switch can now flip the stabilizer between "OFF" (towards you) and "2D Mode" (away from you). Consult the manual to ensure that the stabilizer is working properly. Briefly, if the plane is powered up and the stabilizer is in 2D Mode, then moving the model away from level should result in the control surfaces being moved to cancel that movement out. The manual has a more precise process to confirm things are right. If you want to fiddle more with the stabilizer, consult the manual. There are plenty of options. But "2D On/Off" with the three dials turned all the way to the right works fine for me. Note: If you leave the MOD input of the stabilizer (for Mode: 2D, 3D, or Off) unconnected, the stabilizer will default to 2D mode on. You can then free up channel 5 for something else if you wish, if you don't mind that you'll be unable to disable the stabilizer as a result. Now that everything is built and working properly, here are some tips for your first flight. Ensure all batteries are charged up. Power on the Plane by plugging in the battery. Get startup beeps. Move the controls and ensure the plane responds correctly. Ensure the stabilizer is on. You're sort of going to be on your own for launching, flying, and landing but here are some tips. Take-off is easiest by hand-launching. Get a friend to hold the model (fingers away from the prop!) ready to toss like a paper airplane. They're holding that plane tight, right? Ramp the throttle up to maximum. With throttle at max, have your friend throw the plane like a paper airplane, thrown a little upwards. Steer as needed to keep from crashing and gain some altitude. Get straight and level before you back off on the throttle. Your plane's not meant to do full throttle for extended periods, but don't back off on it until you're ready. On my setup, the video signal starts to get iffy at several hundred meters range. You should safely get at least a good 12-15 minutes (probably a fair bit more) of flight out of your battery. If the 11.1V battery is reading around 10.5-11V, call it quits. Overdischarging the batteries will permanently damage them. My biggest problem - which led to a whole plane being repeatedly broken and repaired until it died without ever properly flying - was being too timid with the takeoffs. You can't slowly ease into it. I eventually learned to launch at full throttle and don't wimp out until you're up in the sky. Don't back off the throttle until you're flying straight and level. 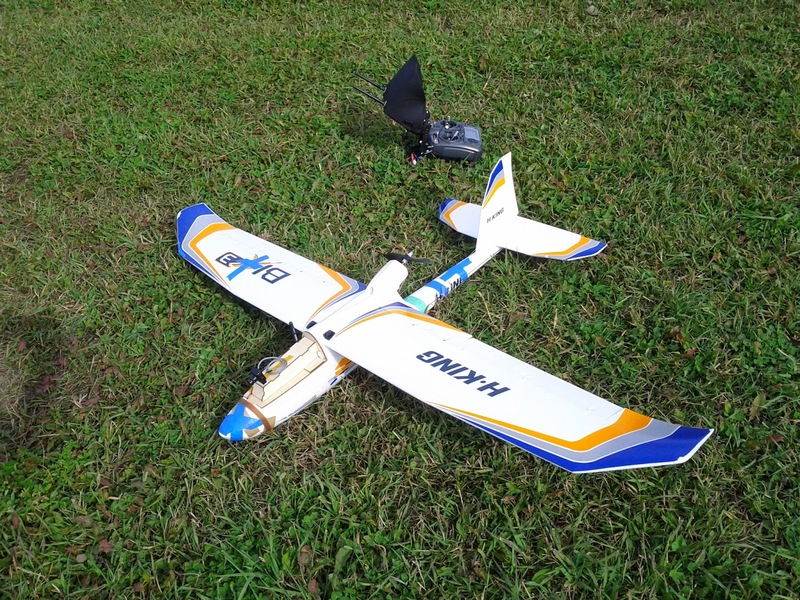 For landing, you can get low and straight and cut the throttle - you'll glide with this model for a while. It's easiest to belly-land on grass, and it's easier to land by watching the plane instead of the camera feed. Disconnect the battery from the plane. Of course, what I really want is a Phantom 3 from DJI. DVR Recorder - this unit allows recording the video of your flights. It can be set to automatically begin recording on powerup. Update: This unit works fine - I used it to record this video. HobbyKing E-OSD - this unit is small enough to not affect the COG, and with a little soldering is a good addition to a plain FPV setup. 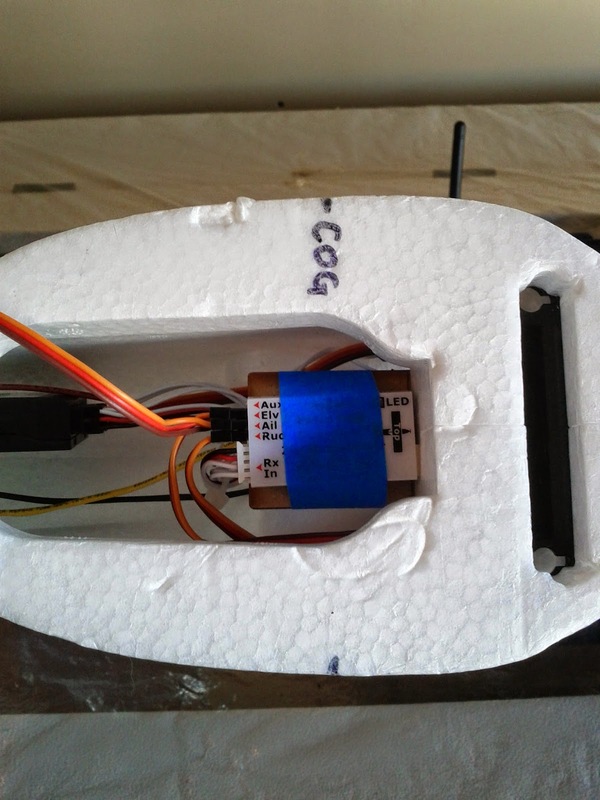 It will provide a voltage readout of the plane's battery on your video feed, along with a flight timer. Update: this works great, it provided the voltage read-out at the top of the screen in the animations on this page. ImmersionRC EzOSD - this is a fancy unit with GPS that will give you not only battery readouts but tell you position and point you back home. I own one and it works, but I haven't put it on my plane yet. Fat Shark Head Tracker goggles bundle - Here is why channels 6, 7, and 8 are free on my radio: I want to move to pan/tilt/roll head tracking goggles and camera once I'm not too chicken to attach all this $$$ to my plane. Fat Shark Pan/Tilt/Roll camera mount for use with above. Most camera mounts do Pan and Tilt, but man - adding the Roll capability with goggles is really worth trying. Extremely economical head-mounted display for experimentation and so-so results! Boscam camera with integrated HD recorder and video TX - confirmed works with the Skyzone monitor and receiver listed above. I haven't used it on a plane yet but it works with my monitor just fine. Skyzone Plug-N-Play FPV bundle (200mW) this package requires a monitor with video input, possibly the cheap goggles listed above.